Yes, this is the inevitable post on the upcoming General Election. I won’t mind at all if you skip to the links below. Like most of you, I spent Easter wondering why there’s so little political debate in our lives these days. Such a cosy consensus! Everyone just getting on with the important things in life like laughing, cooking good food, dancing, comparing low-cost  investment platforms, and curing cancer. Thank goodness Theresa May divined again the mood of the nation and called  a snap General Election. Will my longer-term misgivings prove equally wide of the mark, too? Economically it will be hard to tell. I was never predicting doom – that’s a straw man, really – rather worse  than we would have otherwise had. Socially and culturally, how bad things get may depend on how far politicians go in implementing the self-destructive Will Of The People. The rise of populist sentiment (which we can define as parts of the electorate asking for things that mainstream politicians think are both stupid and impossible) pretty much never leads to populist policies being implemented (they are often indeed stupid and impossible). But it does have a long and useful history of changing the direction of mainstream politics. Merryn deserves plaudits for being one of the Liberal (-ish) Elite who came out for Leave before the vote, and whose predictions to-date have been better than most. She is also one of those who believe May called the election to strengthen her hand against the Brexit extremists in her own party. Get this done properly, Merryn argues, and we can have a fairly decent trade deal, fairly free movement of people (with tougher welfare caps), an acceptable exit bill, and the all-important regaining of parliamentary sovereignty. I hope Merryn continues to be right. And the pound has already rallied on this sort of thinking, reversing some of the windfall gains I talked about when I suggested it might be time to investigate currency hedged ETFs  back in January. But whatever kind of Brexit we ultimately get, as I’ve said before I don’t think the ends – of which taking back full control of UK law was by far the most legitimate – will justify the means. The dog whistle politics, the NHS bus boast, the telling people they can have what they can’t. So even if people like me should be pleased the Prime Minister has called an election that could ultimately lead to a softer Brexit, the ratcheting up of the populist rhetoric in her speech is another black mark on the UK’s political record. Sometime in the 17th century, Louis XIV is said to have told a gathering in Paris, “L’etat, c’est moi” – I am the nation. Whether he ever actually uttered that phrase is disputed, but it sums up his unshakeable belief in the divine right of kings – that there was no difference between the interests of France and those of himself. Well: today we learned that Theresa May feels exactly the same. To convince the world she has brought Britain together, she must find a way of dismissing those who disagree as somehow illegitimate. 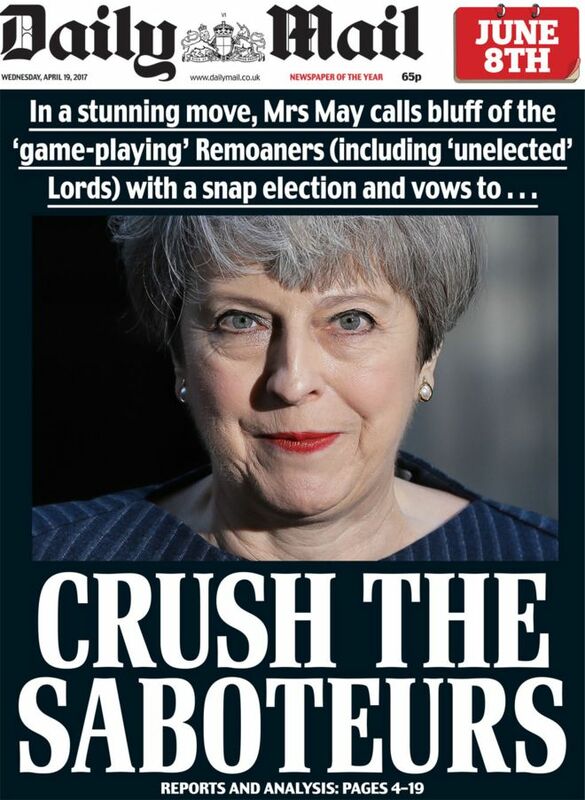 Opposing her is opposing Britain. Voting for anyone but the Tories is thus unpatriotic. May’s speech announcing the election was, paradoxically, profoundly anti-democratic. This rather charmingly combined a totally made-up fact (the country is coming together) with a bizarre whine that parliamentary democracy is functioning as it should. Any persistent total unity in an elected assembly, after all, would signal that it had been hijacked by a fascist. If there were no “division” in Westminster, we would find ourselves in a de facto one-party state, in which the wisdom of the dear leader is all – a vision of “strong leadership” at which Vladimir Putin would nod sagely. When this cover went viral many people assumed it was a parody, which shows how far we’ve traveled (down) in a few months. This is supposed to be a General Election about a range of issues. But barring some kind of campaign trail gaffe it’s going to be Brexit, Brexit, Brexit. Needless to say the Labour party opposition is so poor that even avowed floating voters like me despair. A tactical voting spreadsheet  spread like wildfire across my left-leaning Liberal Elite echo chamber. It purported to explain how to vote to get the Tories out of power. True, I could vote for the Liberal Democrats if I took this ‘second referendum’ at about-face value. But where I live my vote would be wasted. Meanwhile my local Labour MP is thankfully more New Labour than Corbyn’s Old Labour, I’m in a swing seat – and playing game theory with May’s secret motivations only gets me so far. I have voted Conservative in the past (I’ve voted for all the main parties) but I have no appetite for a right-wing coronation right now. Many people like me will be playing this sort of mental Jenga in this election. Hardly ideal. What are the personal finance and investing consequences? I joked to a friend a couple of weeks ago that the Conservatives might have to call a General Election if their ‘no mainstream tax rises’ pledge proved crippling in the face of bad Brexit. I can’t help wondering if the fiasco over National Insurance in the recent Budget helped tip May’s hand towards the red button. Some Tory hardliners are already panicking  at the prospect of tax rises to come, but the reality is the pledge itself was a panicked move in the last election. Governments need to be able to adjust the tax base at the best of times, and the next few years are unlikely to be that. But again, who really knows? Perhaps if the talks drag on for five years, the pound stays low-ish, and we stay in a fast-recovering EU for much longer than expected then the economy will continue to boom. Not much use if you’re a poorer Brexit-voter facing rising prices caused by the weak pound and a falling real income, true, but not so bad for the majority of Monevator readers. No, much like the past year or so, the frontline of this battle will be fought on emotional territory, not economic matters – whatever people on either side of the fence may believe about their cold-headed analysis of the facts. I will admit that I’ve had to learn a few things in the post-EU Referendum climate. I thought I was ahead of the game in noticing how inequality was setting up fault lines  in our society. However I underestimated  the emotional divisions wrought – or at least brought out – by globalization. In particular I hadn’t noticed what’s since been well-documented – to massively oversimplify the deep differences  between those who believe that you should get up and go, and those who think we should stick to what we know and support those who do so. Both impulses have their place in fashioning a society that works. But it was (and is) much easier for me to empathize with Claudia, an Eastern European immigrant and reader who despaired  that having traveled to an unfamilar country to crowd into over-priced accommodation far from her job and a plane ride from her friends and family and now working long days at the sharp end of the service industry, she was being scapegoated as part of the problem by people who won’t move from one ex-industrial town to the next. I think we can agree that these relatively low-paid service jobs will not magically move up to Northern England after Brexit, hence the poor people there who were willing to vote out immigrants of the UK because they supposedly make everything worse, will actually have no gain out of the situation. As somebody who left home for London and who has swapped careers/industries twice to keep myself moving forward, I’m still on the same page as her. Yet months of reading has helped me understand better those who don’t like the direction that society is going. The people who are upset or alienated by the rate of change, the erosion of previous values, by too many unfamiliar voices or faces on their High Street, or by the opaque (if in my view concrete) benefits even to them of globalisation and integration. The trouble is there’s not much to be done with this new understanding. I now see better that people can feel that way, but that still doesn’t make their argument logically correct as far as I’m concerned. And they would say the same about me. I don’t believe Brexit can deliver what many of those people want deep in their hearts. It’s near-impossible, short of some new Dark Ages that reverses at the least technological progress and I doubt they’d really want that. Perhaps stopping immigration and erecting trade barriers would soften the blow emotionally (although not economically) but it probably still wouldn’t be enough. Yet even in its softest form, Brexit will leave the other half like me unhappy. It’s like we’re in a marriage where one partner has confessed to an affair and we’ve decided to make a go of staying together, but something has changed forever. A landslide win could give Theresa May the mandate – and votes – to overwhelm the extremists on the fringes of her party and deliver some sort of workable Brexit. But I am not quite sure what – except perhaps time, economic growth, more conversation, and perhaps more redistribution – can start to fix the deeper issues. Note: I’ve been as temperate as I can in the article above – within the limits of being a writer who has to produce something vaguely readable. I think we’d all benefit if anyone who wants to comment below tries to do the same. Thanks! Product of the week: If you told people a decade ago that in 2017 you’d be able to get a mortgage charging just 0.89%, they’d have assumed we’d be living in a second Great Depression. With inflation over 2%, in real terms the bank is paying you to take its money! Yet as The Telegraph  reports, that spectacularly negligible charge is exactly what’s being levied by Yorkshire Building Society . Catches abound: It’s a variable not fixed rate, you must have 65% equity in your home, there’s more than £1,500 in fees to pay, and also a 1% early exit penalty. (While I’m here, remember that super-cheap Atom Bank mortgage flagged up a fortnight ago that I said wouldn’t last? Well, it didn’t. It was withdrawn after just nine days! Be nimble if you can with these challenger banks). Book of the week: The Book Essay feature in the Financial Times is an appropriately excellent read. It’s a wander through a topical subject via a few on-trend tomes. If you can scale the pay-wall [perhaps via this search result ] then this week’s discussion on the intersection between the remorseless outsourcing of modern businesses and the dash for freedom by some of the self-employed is worth a read. The books highlighted include Down and Out in the New Economy  by Ilana Gershon, The Amateur  by Andy Merrifield, and Masters of Craft  by Richard E. Ocejo. Like these links? Subscribe  to get them every week!